Some people seem to be name geniuses. They hear a name just one time, then remember it forever. How do they do it? While we can’t unravel that mystery, we can give you some tips that will help learning names happen faster. Yes, prep is even a part of learning names. But this is easy prep! If you already have a list of your students, read over it a few times before the first day. As you do, jot down anything (or anyone) the names make you think of. Pray for each student by name if you can. Connect the names with someone you know or someone famous. For instance, if you have someone in your class named Emma, you could think of Jane Austen’s Emma. If you have a nephew named Ethan and a student named Ethan, make that association. As you meet each student or parent, focus on them and on their name. It’s too easy to think about what you need to do next or what’s happening in your classroom, but don’t let yourself get distracted. If you don’t focus on a person’s name and face in the first place, you don’t give yourself a chance to remember it. Take a first-day-of-school class picture. Use that picture and your seating chart when you get home, and you can focus on learning names without having to teach at the same time. You might already be doing this one. Use each name as many times as you can without it seeming awkward. 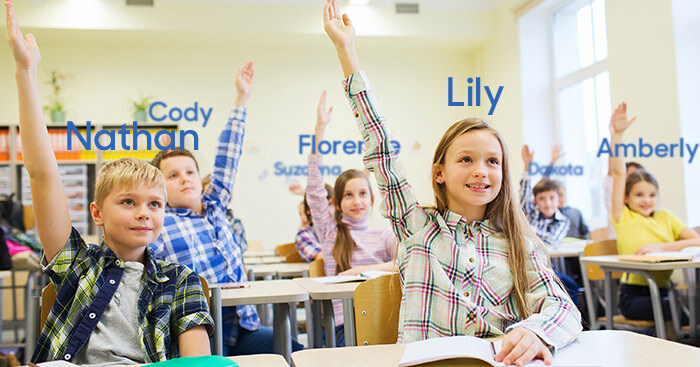 Instead of just acknowledging a student raising his hand or doing a good job, look up his name on the seating chart if you have to and use it. This also goes a long way in letting each child know you care about getting to know them personally. Connect names with another word or image, then actually picture it when you see that student. For example, imagine a student named Brooke standing in a brook. For someone named Paige, think of the page of a book. For someone named Thomas, you could think of Thomas Jefferson or Thomas Aquinas the philosopher, or even Toms-brand shoes. Whatever connection you make—and it can be a crazy one!—the image will help you remember the name. Take mental note of details that stand out to you (like really long eyelashes, a distinctive style, interesting voice, etc.). Write out those details next to that person’s name on your seating chart. You may have heard many of these tips before, but the key is actually putting them into practice. If it seems like too much, here’s some encouragement—caring about learning names helps you do it faster. So you’re already part of the way there!